I am always on the hunt for new rotisserie chicken recipes because it’s an easy weeknight meal to prepare, when I don’t have much time or energy. I’ve used rotisserie chicken for quite a few of these shredded chicken recipes and they’ve turned out so good. Eliminating the step of having to cook the chicken helps me put dinner on the table for my family in no time. 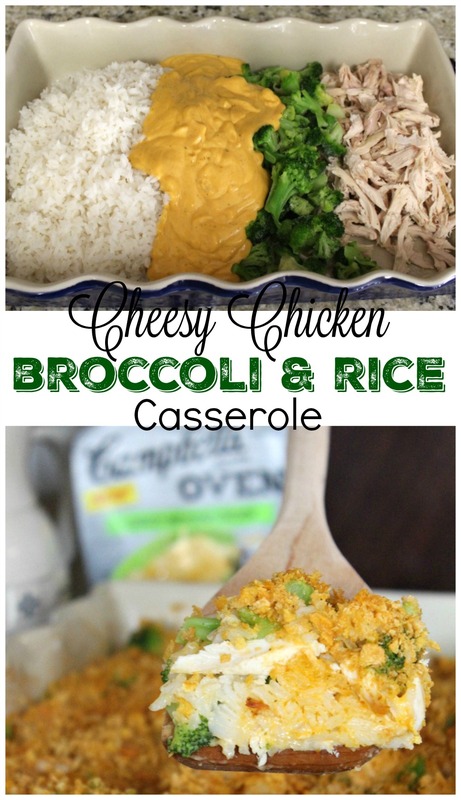 I had the chance to try out Campbell’s Dinner Sauces – the new Oven Cheesy Broccoli Chicken to be exact, and made a Cheesy Chicken, Broccoli and Rice Casserole for dinner. 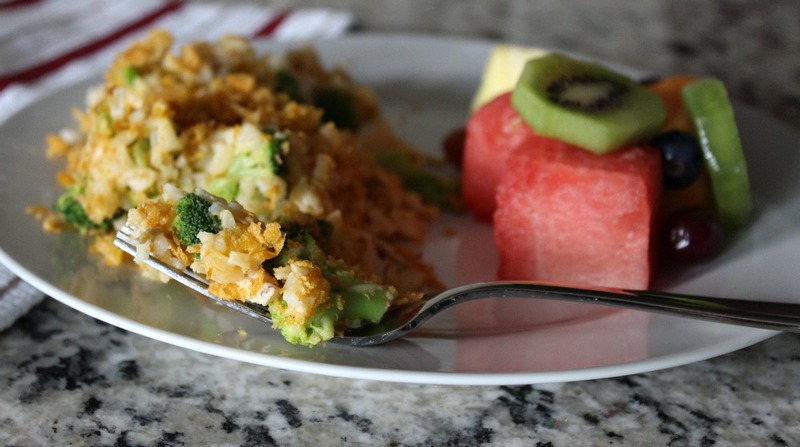 One of my favorite meals growing up was my parent’s Chicken and Rice casserole. It was filling, it had great flavor and as a kid – it just made me happy! I’ve since carried on that tradition and have made this same casserole a lot in my almost 18 years of being a parent, as well as when my husband and I were first married. As I was trying to come up with a recipe to make with the Campbell’s Sauce, I knew it had to be easy, flavorful, kid pleasing and comforting. On the back of the Campbell’s Oven Sauce, it has a 3-step recipe. You place the boneless, skinless chicken breasts in a 9×13 pan. Then you place the frozen broccoli florets in the pan (nope, you don’t even need to thaw them) and pour the cheesy sauce over everything and bake. It’s that easy. My recipe requires just a few more steps, but it’s still so easy, my kids could do it. 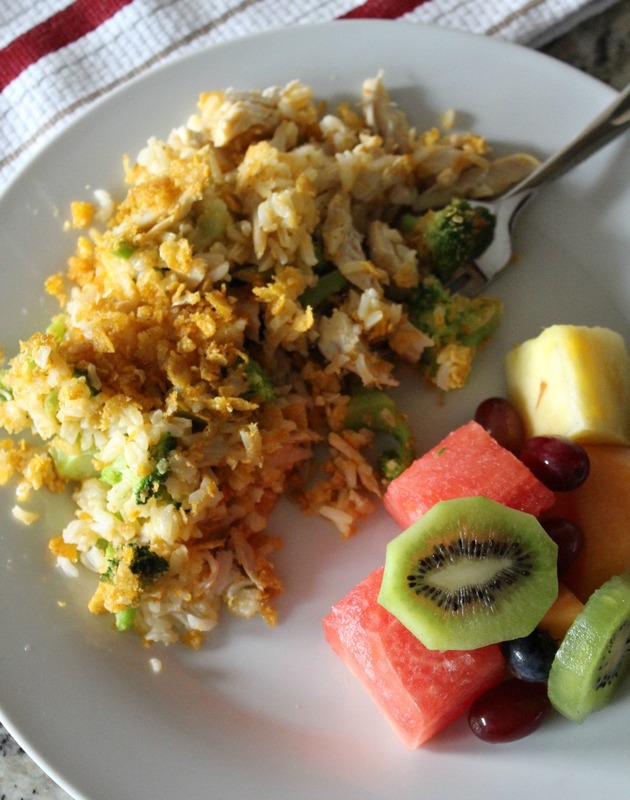 You need cooked rice for this recipe and you need to shred the chicken. The rice takes about 15 – 20 minutes to make, so while it’s cooking, use this time to shred the chicken. 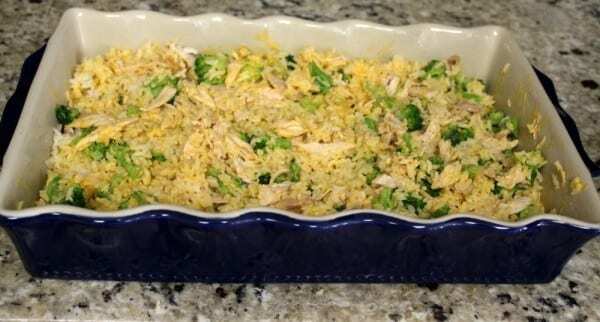 After the rice is finished, pour it in a greased 9×13 casserole dish. 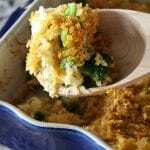 Then add the shredded chicken, frozen broccoli florets and cheese sauce. Although you could mix this up in a bowl, why dirty up another dish? Just mix it together in your 9×13 pan! At first, I wasn’t going to top this with anything. And then I thought about topping it with crushed crackers and butter. But then I remembered eating a rice casserole one time where they had topped a casserole with crushed corn flakes. Perfect! I poured about 1 cup of corn flakes in a baggie and used a rolling pin to crush them. 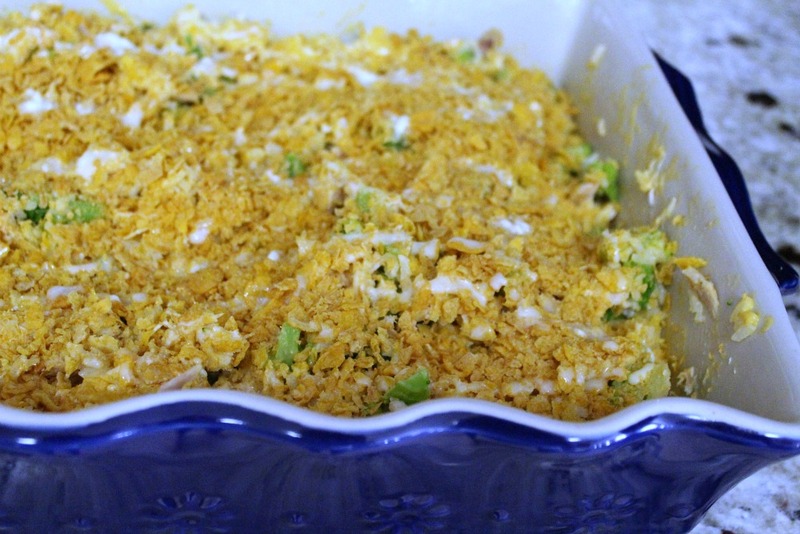 Sprinkle the crushed corn flakes over the casserole, and drizzle 2 Tbsp of melted butter over the corn flakes. Bake it in the oven at 350 degrees F for 25 – 30 minutes and dinner is ready! I served ours with a fruit salad. Since you already have a protein, vegetable and starch in the casserole – all you needed to make this a complete meal is some fruit. 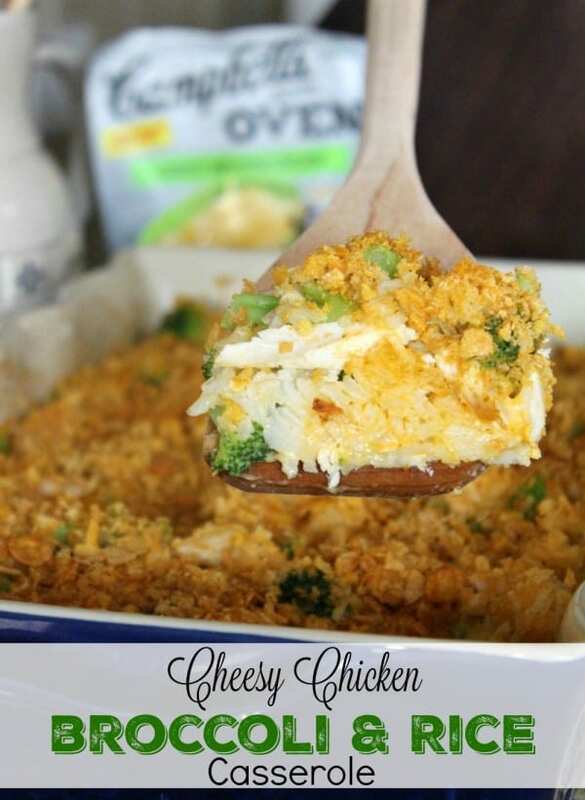 The cheesy sauce with the broccoli and the crunch of the corn flakes made this one tummy satisfying meal! Plus, we had enough for leftovers, which I swear taste better than when it first came out of the oven. And I’m not a big fan of leftovers! When it comes to planning, shopping, prepping and cooking meals for our families – it can be exhausting. But with a few quick and kid-pleasing meals in our arsenal like this one, it makes life during the week a little easier. Not only can you spend less time in the kitchen preparing the meal, but also less time cleaning up. You know what that means? More time for other things! Be sure to check out more of Campbell’s new products?, plus some delicious Campbell’s recipes and follow @Campbells on social media! This a brand I grew up with and one I continue to use to feed my family. 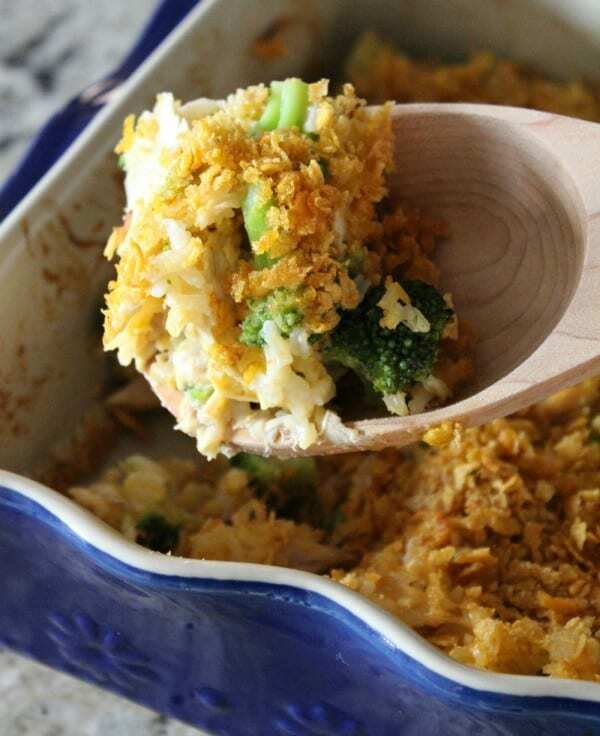 A cheesy casserole perfect for a weeknight meal using rotisserie chicken. 1. Preheat oven to 350 degrees F. Grease 9x13 inch pan. 2. Cook the rice according to package directions. While the rice is cooking, shred the rotisserie chicken. 3. 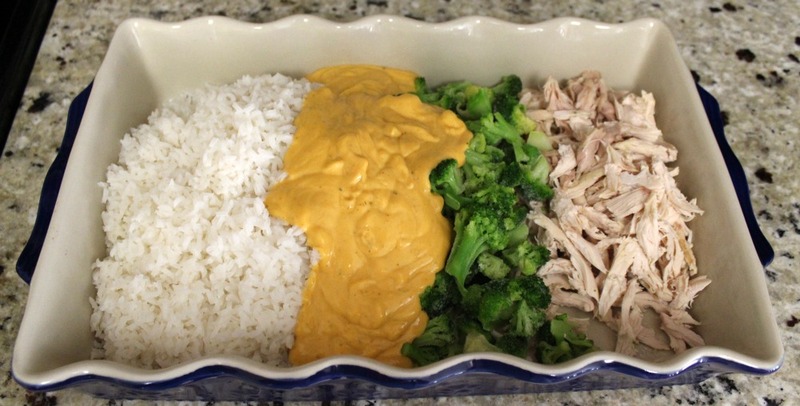 In the greased 9x13 pan, pour in the cooked rice, the shredded rotisserie chicken, frozen broccoli and cheese sauce. Mix together until everything is evenly distributed. 4. Sprinkle crushed corn flakes on top, covering evenly. Drizzle on the 2 Tbsp melted butter. 5. Bake for 350 degrees F for 25 minutes, or until corn flakes are lightly browned and the casserole is bubbling.